With cooking being the theme of this month’s CULTURE BOX, food has really been on our minds lately! There’s pretty much nothing more natural than the ingredients that go into making delicious meals, and we all know how good natural products are for our skin. So, why not combine the two together? There are lots of face masks which are food-based, but these Mediheal Ade masks are our favourite! With 6 different types, one for every purpose, from moisturizing to skin tightening, you’re bound to find one to suit your needs. We recommend you buy these in bulk and use them 2-3 times a week over 4 weeks. You’ll definitely notice the difference! Eggs are becoming a trendy ingredient in many K-Beauty products, so much so that popular brand Tony Moly has their own ‘Egg Pore’ range! This product is a primer that contains egg white and it really makes skin clear and even. This product for your lips from beauty brand 24/7 is two products in one, a trendy concept in Korea. One side protects and treats chapped lips, using YooChae honey that has been sourced from Jeju Island. The other side is a creamy coral lipstick which is designed to suit everyone, no matter your skin tone! We don’t know about you, but we are absolutely obsessed with bubble tea! 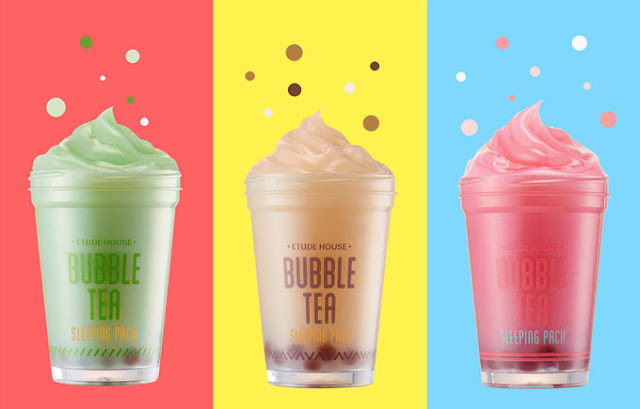 So when we heard that Etude House has made a beauty product that’s based on this addictive drink, we just had to find out more. Coming in green tea, black tea and strawberry this product looks exactly like bubble tea, except it’s used on your skin instead! Skinfood is one of our favourite beauty Korean beauty brands, as all of its products are food-based. We decided to highlight the White Grape Fresh Foundation, as it isn’t common to find a makeup base like this with food as a main ingredient. Coming in 3 different shades, hopefully there will be one to suit you. Plus, who doesn’t like white grape extract? That’s all from us! We hope you like our choices and that you’re inspired to try a few of these out yourself. Just remember, although these products contain food, we don’t recommend you eat them, no matter how delicious they look!